Lemurs of Madagascar rainforests are endemic to the island. Lemurs are relatively primitive primates. While they were replaced by monkeys and other primates on the mainland Africa and other parts of the world, on Madagascar Island they could survive in isolation. Most lemur species are endangered today, and many have gone extinct. This is mainly due to massive rainforest destruction that has been going on on Madagascar - 90% of the original rainforest is gone. But many lemurs are also killed by superstitious people who are intimidated by their spooky look. Lemurs got their name from the old belief that they were ghosts or spirits. There are about 100 species of lemurs of Madagascar and thery belong to five families. 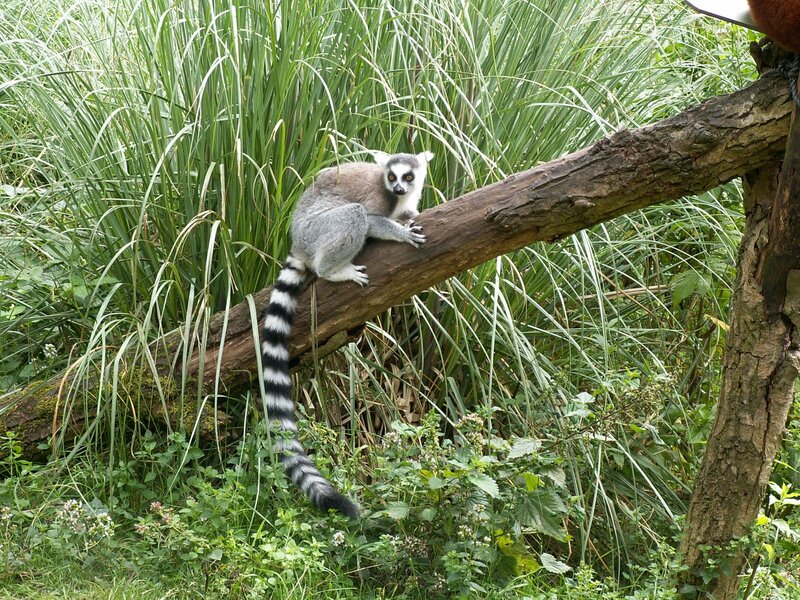 Lemurids (Lemuridae) are medium sized tree dwellers with a long tail which helps them balance. This group contains ring tailed lemurs (Lemur catta); ruffed lemurs such as Red Ruffed Lemur (Varecia rubra) and Black-and-white Ruffed Lemur (Varecia variegata); bamboo lemurs such as Greater Bamboo Lemur (Prolemur simus), Western Lesser Bamboo Lemur (Hapalemur occidentalis), Golden Bamboo Lemur (Hapalemur aureus), Lac Alaotra Gentle Lemur (Hapalemur alaotrensis), Gilbert's Bamboo Lemur (Hapalemur gilberti), Southern Lesser Bamboo Lemur (Hapalemur meridionalis), Eastern Lesser Bamboo Lemur (Hapalemur griseus); and brown lemurs such as Red-bellied Lemur (Eulemur rubriventer), Sclater's Lemur (Eulemur flavifrons), Sanford's Brown Lemur (Eulemur sanfordi), Red-fronted Lemur (Eulemur rufifrons), Mongoose Lemur (Eulemur mongoz), Black Lemur (Eulemur macaco), Gray-headed Lemur (Eulemur cinereiceps), Collared Brown Lemur (Eulemur collaris), Red Lemur (Eulemur rufus), White-headed Lemur (Eulemur albifrons) and Common Brown Lemur (Eulemur fulvus). Sportive Lemurs (Lepilemuridae) are a group of medium-sized, solitary, territorial, nocturnal and mostly tree dwelling and mainly herbivorous lemurs with brownish back and yellowish belly. The group includes Hawk's Sportive Lemur (Lepilemur tymerlachsoni), Red-tailed Sportive Lemur (Lepilemur ruficaudatus), Northern Sportive Lemur (Lepilemur septentrionalis), White-footed Sportive Lemur (Lepilemur leucopus), Gray-backed Sportive Lemur (Lepilemur dorsalis), Small-toothed Sportive Lemur (Lepilemur microdon), Seal's Sportive Lemur (Lepilemur seali), Ankarana Sportive Lemur (Lepilemur ankaranensis), Scott's Sportive Lemur (Lepilemur scottorum), Hubbard's Sportive Lemur (Lepilemur hubbardi), Aeecl's Sportive Lemur (Lepilemur aeeclis), Wright's Sportive Lemur (Lepilemur wrighti), Ahmanson's Sportive Lemur (Lepilemur ahmansoni), Randrianasoli's Sportive Lemur (Lepilemur randrianasoli), Grewcock's Sportive Lemur (Lepilemur grewcocki), Sahamalaza's Sportive Lemur (Lepilemur sahamalazensis), Manasamody Sportive Lemur (Lepilemur manasamody), Petter's Sportive Lemur (Lepilemur petteri), Betsileo Sportive Lemur (Lepilemur betsileo), Fleurete's Sportive Lemur (Lepilemur fleuretae), Otto's Sportive Lemur (Lepilemur otto), Weasel Sportive Lemur (Lepilemur mustelinus), Ring Sportive Lemur (Lepilemur milanoii), James' Sportive Lemur (Lepilemur jamesi), Holland's Sportive Lemur (Lepilemur hollandorum) and Milne-Edwards' Sportive Lemur (Lepilemur edwardsi). Indrids are a group of only 13 species left after many, including some chimpanzee and gorilla sized species have gone extinct. They are tree dwellers and strict herbivores. The species that still exist today are Indri (Indri indri); sifakas such as Crowned Sifaka (Propithecus coronatus), Van der Decken's Sifaka (Propithecus deckenii) and Coquerel's Sifaka (Propithecus coquereli), Verreaux's Sifaka (Propithecus verreauxi), Golden-crowned Sifaka (Propithecus tattersalli), Perrier's Sifaka (Propithecus perrieri), Milne-Edwards' Sifaka (Propithecus edwardsi), Silky Sifaka (Propithecus candidus), Diademed Sifaka (Propithecus diadema); and woolly lemurs such as Southern Woolly Lemur (Avahi meridionalis), Western Woolly Lemur (Avahi occidentalis), Eastern Woolly Lemur (Avahi laniger), Moore's Woolly Lemur (Avahi mooreorum), Betsileo Woolly Lemur (Avahi betsileo), Ramanantsoavana's Woolly Lemur (Avahi ramanantsoavana), Peyrieras' Woolly Lemur (Avahi peyrierasi), Bemaraha Woolly Lemur (Avahi cleesei) and Sambirano Woolly Lemur (Avahi unicolor). There is only one species of this family left today: aye-aye (Daubentonia madagascariensis). It lives mainly in rainforests in the eastern parts of Madagascar Island. It is a nocturnal animal that eats mainly plant material like seeds, nectar, fruits and nuts. When its habitat is lost it is forced to steal food from people. The species is endangered not only because of the massive rainforest destruction but also because of the disliking by people, and the superstitious myth that it is an evil spirit and the only way to avoid bad luck is to instantly kill it. This is made easy by aye-aye's brave nature. Dwarf and Mouse Lemurs (Cheirogaleidae) are small lemurs that only grow max 28cm long and weigh max 1/2kg (but most often much less). They are nocturnal tree dwellers that eat both plant material such as flowers, fruits and leaves, and carnivorous food such as insects and spiders. The group includes mouse lemurs such as Arnhold's Mouse Lemur (Microcebus arnholdi), Lokobe Mouse Lemur (Microcebus lokobensis), Madame Berthe's Mouse Lemur (Microcebus berthae), Golden-brown Mouse Lemur (Microcebus ravelobensis), Margot Marsh's Mouse Lemur (Microcebus margotmarshae), MacArthur's Mouse Lemur (Microcebus macarthurii), Northern Giant Mouse Lemur (Mirza zaza), Bongolava Mouse Lemur (Microcebus bongolavensis), Reddish-gray Mouse Lemur (Microcebus griseorufus), Claire's Mouse Lemur (Microcebus mamiratra), Simmons' Mouse Lemur (Microcebus simmonsi), Mittermeier's Mouse Lemur (Microcebus mittermeieri), Jolly's Mouse Lemur (Microcebus jollyae), Coquerel's Giant Mouse Lemur (Mirza coquereli), Goodman's Mouse Lemur (Microcebus lehilahytsara), Brown Mouse Lemur (Microcebus rufus), Pygmy Mouse Lemur (Microcebus myoxinus), Sambirano Mouse Lemur (Microcebus sambiranensis), Northern Rufous Mouse Lemur (Microcebus tavaratra), Gray Mouse Lemur (Microcebus murinus); dwarf lemurs such as Hairy-eared Dwarf Lemur (Allocebus trichotis), Sibree's Dwarf Lemur (Cheirogaleus sibreei), Greater Iron-gray Dwarf Lemur (Cheirogaleus ravus), Lesser Iron-gray Dwarf Lemur (Cheirogaleus minusculus), Furry-eared Dwarf Lemur (Cheirogaleus crossleyi), Greater Dwarf Lemur (Cheirogaleus major), Southern Fat-tailed Dwarf Lemur (Cheirogaleus adipicaudatus), Fat-tailed Dwarf Lemur (Cheirogaleus medius); and fork-crowned lemurs such as Pariente's Fork-crowned Lemur (Phaner parienti), Pale Fork-crowned Lemur (Phaner pallescens), Mt. d’Ambre Fork-crowned Lemur (Phaner electromontis) and Masoala Fork-crowned Lemur (Phaner furcifer).